As onshore crude oil production in the United States increased over the past few years, producers have increasingly moved crude oil out of production areas by rail. Producers in North Dakota, in particular, have used rail to ship crude oil to refineries and midstream companies at newly built unloading terminals on the East Coast and West Coast. The number of rail carloads of crude oil began rising in 2012, as production in the Bakken Shale and other shale plays grew. According to the North Dakota Pipeline Authority, Bakken rail outflow capacity totaled 965,000 barrels per day (bbl/d) at the end of 2013, compared to 515,000 bbl/d of pipeline capacity. While some refineries are being built or planned for the area, most Bakken crude oil will continue to be moved out of the region to be processed at refineries in other parts of the country. Two refineries, PBF Energy in Delaware City and Philadelphia Energy Solutions in Philadelphia, receive crude oil directly by rail, with unloading capacity of 120,000 bbl/d and 160,000 bbl/d, respectively. Enbridge's Eddystone Rail facility, located outside Philadelphia, began operating in May 2014. This facility is able to transfer 80,000 bbl/d to Philadelphia-area refineries by barge after receiving rail shipments. Other rail unloading facilities that transfer crude by rail to barge for transport to refineries are located in Yorktown, Virginia, and Albany, New York. Tesoro, which currently has capacity to unload 50,000 bbl/d at its refinery in Anacortes, Washington, has proposed a 360,000 bbl/d facility at the Port of Vancouver, also in Washington. In addition, several new unloading terminals are planned to open in 2014 and 2015, with most of the unloading capacity in California and Washington. 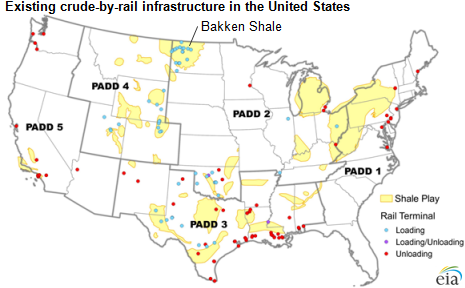 In addition to crude-by-rail loading facilities in the Bakken, new rail terminals have been built to transport crude oil production from the Niobrara Shale formation in Colorado and Wyoming, and the Permian Basin in West Texas and southeastern New Mexico. Several crude-by-rail loading terminals are already operating in the Niobrara, which has access to a vast rail network to transport abundant coal production from Wyoming's Powder River Basin. While the Permian Basin has much greater oil production than the Niobrara Shale, it also relies more on pipelines to transport crude oil production. However, in response to significant production growth there, particularly from tight oil formations, Rangeland Energy last month began construction on its RIO Hub rail loading terminal in Loving, New Mexico. This terminal is scheduled to begin operating later this year, with the project's developers expecting to eventually raise its capacity to 100,000 bbl/d. In addition to crude oil pipeline flows, EIA's U.S. Energy Mapping System now enables users to see where these growing crude oil flows by rail are occurring. The mapping system now includes a new layer showing the location of crude-by-rail terminals in the United States (seen the map above). In addition to the new Crude Oil Rail Terminal layer, the U.S. Energy Mapping System has two other new layers—for ethylene crackers and wind turbines—and has several updates to existing layers.